Adaptive radiation—Diversification of a species or single ancestral type into several forms that are each adaptively specialized to a specific niche. Agonistic—Behavioral patterns that are aggressive in context. Allopatric—Occurring in separate, nonoverlapping geographic areas. Alpha breeder—The reproductively dominant member of a social unit. Altricial—An adjective referring to a mammal that is born with little, if any, hair, is unable to feed itself, and initially has poor sensory and thermoregulatory abilities. Amphibious—Refers to the ability of an animal to move both through water and on land. Austral—May refer to "southern regions," typically meaning Southern Hemisphere. May also refer to the geographical region included within the Transition, Upper Austral, and Lower Austral Life Zones as defined by C. Hart Merriam in 1892-1898. These zones are often characterized by specific plant and animal communities and were originally defined by temperature gradients especially in the mountains of southwestern North America. Bergmann's rule—Within a species or among closely related species of mammals, those individuals in colder environments often are larger in body size. Bergmann's rule is a generalization that reflects the ability of en-dothermic animals to more easily retain body heat (in cold climates) if they have a high body surface to body volume ratio, and to more easily dissipate excess body heat (in hot environments) if they have a low body surface to body volume ratio. Bioacoustics—The study of biological sounds such as the sounds produced by bats or other mammals. Biogeographic region—One of several major divisions of the earth defined by a distinctive assemblage of animals and plants. Sometimes referred to as "zoogeographic regions or realms" (for animals) or "phytogeographic regions or realms" (for plants). Such terminology dates from the late nineteenth century and varies considerably. Major biogeographic regions each have a somewhat distinctive flora and fauna. Those generally recognized include Nearctic, Neotropical, Palearctic, Ethiopian, Oriental, and Australian. Blow—Cloud of vapor and sea water exhaled by cetaceans. Boreal—Often used as an adjective meaning "northern"; also may refer to the northern climatic zone immediately south of the Arctic; may also include the Arctic, Hud-sonian, and Canadian Life Zones described by C. Hart Merriam. Brachiating ancestor—Ancestor that swung around by the arms. Breaching—A whale behavior—leaping above the water's surface, then falling back into the water, landing on its back or side. Cephalopod—Member of the group of mollusks such as squid and octopus. Cladistic—Evolutionary relationships suggested as "tree" branches to indicate lines of common ancestry. Cline—A gradient in a measurable characteristic, such as size and color, showing geographic differentiation. Various patterns of geographic variation are reflected as clines or clinal variation, and have been described as "ecogeographic rules." Cloaca—A common opening for the digestive, urinary, and reproductive tracts found in monotreme mammals. Colony—A group of mammals living in close proximity, interacting, and usually aiding in early warning of the presence of predators and in group defense. Commensal—A relationship between species in which one benefits and the other is neither benefited nor harmed. Congeneric—Descriptive of two or more species that belong to the same genus. Conspecific—Descriptive of two or more individuals or populations that belong to the same species. Contact call—Simple vocalization used to maintain communication or physical proximity among members of a social unit. Convergent evolution—When two evolutionarily unrelated groups of organisms develop similar characteristics due to adaptation to similar aspects of their environment or niche. Coprophagy—Reingestion of feces to obtain nutrients that were not ingested the first time through the digestive system. Cosmopolitan—Adjective describing the distribution pattern of an animal found around the world in suitable habitats. Crepuscular—Active at dawn and at dusk. Critically Endangered—A technical category used by IUCN for a species that is at an extremely high risk of extinction in the wild in the immediate future. Cryptic—Hidden or concealed; i.e., well-camouflaged patterning. Dental formula—A method for describing the number of each type of tooth found in an animal's mouth: incisors (I), canines (C), premolars (P), and molars (M). The formula gives the number of each tooth found in an upper and lower quadrant of the mouth, and the total is multiplied by two for the total number of teeth. For example, the formula for humans is: I2/2 C1/1 P2/2 M3/3 (total, 16, times two is 32 teeth). Dimorphic—Occurring in two distinct forms (e.g., in reference to the differences in size between males and females of a species). Disjunct—A distribution pattern characterized by populations that are geographically separated from one another. DNA-DNA hybridization—A technique whereby the genetic similarity of different animal groups is determined based on the extent to which short stretches of their DNA, when mixed together in solution in the laboratory, are able to join with each other. Dominance hierarchy—The social status of individuals in a group; each animal can usually dominate those animals below it in a hierarchy. Duetting—Male and female singing and integrating their songs together. Echolocation—A method of navigation used by some mammals (e.g., bats and marine mammals) to locate objects and investigate surroundings. The animals emit audible "clicks" and determine pathways by using the echo of the sound from structures in the area. Ecotourism—Travel for the primary purpose of viewing nature. Ecotourism is now "big business" and is used as a non-consumptive but financially rewarding way to protect important areas for conservation. Ectothermic—Using external energy and behavior to regulate body temperature. "Cold-blooded." Endangered—A term used by IUCN and also under the Endangered Species Act of 1973 in the United States in reference to a species that is threatened with imminent extinction or extirpation over all or a significant portion of its range. Endemic—Native to only one specific area. Endothermic—Maintaining a constant body-temperature using metabolic energy. "Warm-blooded." Eocene—Geological time period; subdivision of the Tertiary, from about 55.5 to 33.7 million years ago. Ethology—The study of animal behavior. Extant—Still in existence; not destroyed, lost, or extinct. Extinct—Refers to a species that no longer survives anywhere. Extirpated—Referring to a local extinction of a species that can still be found elsewhere. Feral—A population of domesticated animal that lives in the wild. Flehmen—Lip curling and head raising after sniffing a female's urine. Forb—Any herb that is not a grass or grass-like. Hibernation—A deep state of reduced metabolic activity and lowered body temperature that may last for weeks or months. Holarctic—The Palearctic and Nearctic bigeographic regions combined. Hybrid—The offspring resulting from a cross between two different species (or sometimes between distinctive subspecies). Insectivorous—Technically refers to animals that eat insects; generally refers to animals that feed primarily on insects and other arthropods. Introduced species—An animal or plant that has been introduced to an area where it normally does not occur. Jacobson's organ—Olfactory organ found in the upper palate that first appeared in amphibians and is most developed in these and in reptiles, but is also found in some birds and mammals. Kiva—A large chamber wholly or partly underground, and often used for religious ceremonies in Pueblo Indian villages. Mandible—Technically an animal's lower jaw. The plural, mandibles, is used to refer to both the upper and lower jaw. The upper jaw is technically the maxilla, but often called the "upper mandible." Marsupial—A mammal whose young complete their embryonic development outside of the mother's body, within a maternal pouch. Matrilineal—Describing a social unit in which group members are descended from a single female. Migration—A two-way movement in some mammals, often dramatically seasonal. Typically latitudinal, though in some species is altitudinal or longitudinal. May be short-distance or long-distance. Miocene—The geological time period that lasted from about 23.8 to 5.6 million years ago. Molecular phylogenetics—The use of molecular (usually genetic) techniques to study evolutionary relationships between or among different groups of organisms. Monestrous—Experiencing estrus just once each year or breeding season. Monogamous—A breeding system in which a male and female mate only with one another. Monophyletic—A group (or clade) that shares a common ancestor. species that includes no subspecies). Morphology—The form and structure of animals and plants. Mutualism—Ecological relationship between two species in which both gain benefit. Near Threatened—A category defined by the IUCN suggesting possible risk of extinction in the medium term (as opposed to long or short term) future. Nearctic—The biogeographic region that includes temperate North America. faunal region. Neotropical—The biogeographic region that includes South and Central America, the West Indies, and tropical Mexico. New World—A general descriptive term encompassing the Nearctic and Neotropical biogeographic regions. Niche—The role of an organism in its environment; multidimensional, with habitat and behavioral components. Melon—The fat-filled forehead of aquatic mammals of the order Cetacea. Metabolic rate—The rate of chemical processes in living organisms, resulting in energy expenditure and growth. Metabolic rate decreases when an animal is resting and increases during activity. Old World—A general term that usually describes a species or group as being from Eurasia or Africa. Oligocene—The geologic time period occurring from about 33.7 to 23.8 million years ago. Omnivorous—Feeding on a broad range of foods, both plant and animal matter. Palearctic—A biogeographic region that includes temperate Eurasia and Africa north of the Sahara. Paleocene—Geological period, subdivision of the Tertiary, from 65 to 55.5 million years ago. Pelagic—An adjective used to indicate a relationship to the open sea. Phylogeny—A grouping of taxa based on evolutionary history. Placental—A mammal whose young complete their embryonic development within the mother's uterus, joined to her by a placenta. Pleistocene—In general, the time of the great ice ages; geological period variously considered to include the last 1 to 1.8 million years. Pliocene—The geological period preceding the Pleisto-cence; the last subdivision of what is known as the Tertiary; lasted from 5.5 to 1.8 million years ago. Polyandry—A breeding system in which one female mates with two or more males. Polygamy—A breeding system in which either or both male and female may have two or more mates. Polygyny—A breeding system in which one male mates with two or more females. Polyphyletic—A taxonomic group that is believed to have originated from more than one group of ancestors. Post-gastric digestion—Refers to the type of fermentative digestion of vegetative matter found in tapirs and other animals by which microorganisms decompose food in a caecum. This is not as thorough a decomposition as occurs in ruminant digesters. Precocial—An adjective used to describe animals that are born in an advanced state of development such that they generally can leave their birth area quickly and obtain their own food, although they are often led to food and guarded by a parent. 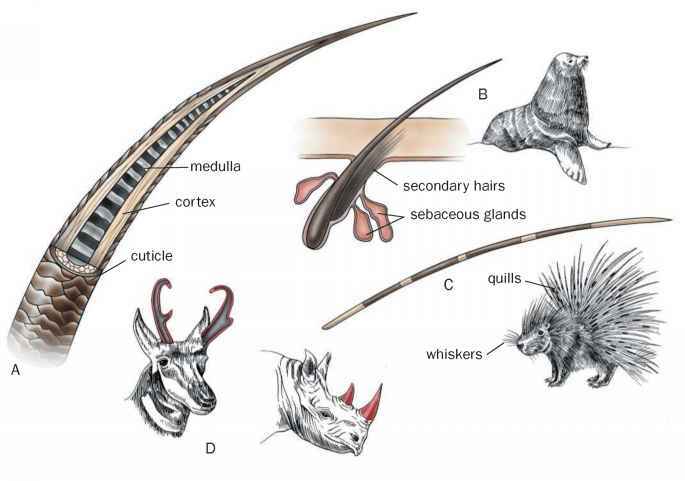 Proboscis—The prehensile trunk (a muscular hydrostat) found in tapirs, elephants, etc. Quaternary—The geological period, from 1.8 million years ago to the present, usually including two subdivisions: the Pleistocene, and the Holocene. Refugium (pl. refugia) —An area relatively unaltered during a time of climatic change, from which dispersion and speciation may occur after the climate readjusts. Reproductive longevity—The length of an animal's life over which it is capable of reproduction. Ruminant—An even-toed, hoofed mammal with a four-chambered stomach that eats rapidly to regurgitate its food and chew the cud later. Seed dispersal—Refers to how tapirs and other animals transport viable seeds from their source to near or distant, suitable habitats where they can successfully germinate. Such dispersal may occur through the feces, through sputum, or as the seeds are attached and later released from fur, etc. Semelparity—A short life span, in which a single instance of breeding is followed by death in the first year of life. Sexual dimorphism—Male and female differ in morphology, such as size, feather size or shape, or bill size or shape. Sibling species—Two or more species that are very closely related, presumably having differentiated from a common ancestor in the recent past; often difficult to distinguish, often interspecifically territorial. Sonagram—A graphic representation of sound. Speciation—The evolution of new species. Spy-hopping—Positioning the body vertically in the water, with the head raised above the sea surface, sometimes while turning slowly. Steppe—Arid land with vegetation that can thrive with very little moisture; found usually in regions of extreme temperature range. Suspensory—Moving around or hanging by the arms. Systematist—A specialist in the classification of organisms; systematists strive to classify organisms on the basis of their evolutionary relationships. Taxon (pl. taxa) —Any unit of scientific classification (e.g., species, genus, family, order). Taxonomy—The science of identifying, naming, and classifying organisms into groups. Territoriality—Refers to an animal's defense of a certain portion of its habitat against other conspecifics. This is often undertaken by males in relation to one another and as a lure to females. Territory—Any defended area. Territorial defense is typically male against male, female against female, and within a species or between sibling species. Area defended varies greatly among taxa, seasons, and habitats. A territory may include the entire home range, only the area immediately around a nest, or only a feeding area. Tertiary—The geological period including most of the Cenozoic; from about 65 to 1.8 million years ago. Thermoregulation—The ability to regulate body temperature; can be either behavioral or physiological. Tribe—A unit of classification below the subfamily and above the genus. (brachiating), walking bipedally with the backbone held vertical. Upper cone—The circle in which the arm can rotate when raised above the head. Viable population—A population that is capable of maintaining itself over a period of time. One of the major conservation issues of the twenty-first century is determining what is a minimum viable population size. Population geneticists have generally come up with estimates of about 500 breeding pairs. Vulnerable—A category defined by IUCN as a species that is not Critically Endangered or Endangered, but is still facing a threat of extinction.